Attention all Interns! There is a vacant doctor's position. This is the chance you have all been waiting for. But how far are you willing to go for it? Will you play nice and work hard or are you up for a little backstabbing and sneaky business at times? As new patients keep pouring in, you must prove that you've got what it takes. And in your attempts to cure diseases, you will occasionally have to deal with the willful misconduct of your fellow players. 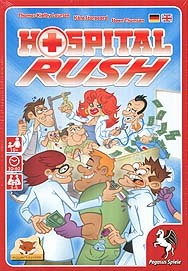 Hospital Rush is pure comical fun and comes with a whole bunch of unique player boards. Their different special abilities bring a great variety to the game and present you with a new challenge each time each time you play.